Following in the similarly crowd-pleasing Drumline and Stomp the Yard’s foot-stomps is dance documentary Step. This year, especially as the film is set against the backdrop of the Black Lives Matter movement and the death of Baltimore’s Freddie Gray, America seems miles away from something so unabashedly heartwarming, sometimes an uncomfortably innocuous offense in a harsh environment, like candy smuggled into prison. The film is a pleasant (if sweetly facile) reprieve from the real world, though the real world threatens this small joy. That threat comes care of the fact that the documentary isn’t just about stepping, but about the successes and struggles of those in the first class to attend the Baltimore Leadership School for Young Women, an all-girls high school with the express goal of having all of its graduating seniors accepted into college. Some of these seniors are founding members of the school’s percussive step team (think Stomp but more empowering) who have stayed with it until their final year. New coach Gari McIntyre works her girls, led by charismatic captain Blessin Giraldo, like a drill instructor: The language and discipline of the military is ever-present at their practices. Team members are dressed down for wearing the wrong shoes, for having bad attitudes, for any lack of personal control that could become a liability once they’ve graduated past the walls of their school. The line between art and business, between the worlds of the amatuer and the professional, is clearly porous here. Counselors, teachers and coaches push a philosophical clarity on these African American girls throughout both their academics and their extracurriculars: You have to work twice as hard as anyone else. In that sense, as the kids take their stepping to competition, director Amanda Lipitz structures Step around the eve of battle as much as on the cusp of looming graduation. In each of Step’s introductory vignettes—whether with stepping senior subjects Blessin, Cori or Tayla—the film engenders empathy for these girls (all of whom are naturals on camera, their personalities coming through instantly) as we realize just how lucky they are and how lucky they shouldn’t have to be. 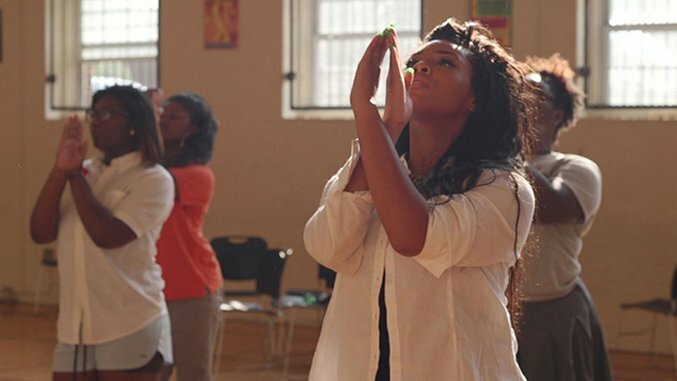 BLSYW is a lottery-based school—its college prep advisors can’t save all the girls in Baltimore, and even those they can help end up facing big problems, which Lipitz portrays with a subjective, low-angled flightiness which projects an intimacy too often undermined by too-frequent cuts. Some girls struggle with electricity-less homes, some with food-less refrigerators but in each case the film allows these nuances to demonstrate the rare meeting of passion and circumstance needed to better such lives. Small cracks do, of course, appear in the bubble of empowerment provided by the school’s environment and by the step team’s physical expression. This expression is powerful and intense, though poorly edited during performances. Step itself may be inherently fun to watch (like a good dance routine or halftime show), but Lipitz’s framing often fails to do these sequences any favors. Sound editing is the most important factor of such moments, but the coordinated stomps, claps and shouts rattle our spirits more than the movements generating the synchronized sonic riot. Like any story where kids want to do better than their parents, the parents are a large component to the film’s drama. The stories of these adults are couched in the same organizational choices that Lipitz and editors Arielle Davis and Penelope Falk use to create subplots in their film. Mini-misdirections and twists spring from the order and juxtaposition of footage, producing dramatic or comedic surprises—like an overbearing dance mom being a tough-as-nails correctional officer outside the gymnasium. The subjects’ personalities succeed based on the same reasons reality TV stars bubble up on the edges of a spotlit community: There is an ambitious performativity to their day-to-day lives, an aspirational enthusiasm for (in this case) an art form that has an innate power for them that most of us can never fully understand. The best parts, though, of this sometimes-sidetracked documentary are those capturing small moments between high schoolers. A hair-styling session buzzes after the question of “MLK Jr. or Malcolm X?” and a buffet date night sours when the boy’s immaturity evolves to selfishness. These moments build relationships with the subjects that render the film’s potentially saccharine story so gently and successfully. Step may stumble over its own hurried pace (cramming months of school into montage after montage), but such a method is almost forgivable once you realize that the film is speeding towards an effective finale that will have you cheering no matter what.